Whether you’ve decided to revamp your garage into an auto showroom, or want to increase the value of your house, an epoxy garage floor coating offers the best balance of economy and quality that will transform your garage into a practical and professional looking addition to your home. Your concrete garage floor takes more of a beating than you probably realize. You drive in and out of your garage on a regular basis; it is constantly subjected to water, dirt, debris, and other materials; and it is the hub for multiple projects. With our high performance floor coatings, you can better protect your floors from the hazards of all these materials and projects. In general, garage floors don’t provide much appeal. If you want something more for your garage in terms of style, a decorative epoxy coating is the answer. With multiple color and style options, out high performance concrete epoxy coatings can give you the exact look you want for a beautifully finished floor. You can receive a look that complements your home, or you can opt for something off the beaten path. Garage concrete coatings are great in hiding imperfections in the concrete. Out decorative color chip coatings will cover those and create an overall aethetic and pleasing look. Coatings are extremely easy to maintain. Because they seal the concrete, coatings keep dirt and debris from penetrating the surface. A simple sweeping is enough to get most of the dirt and debris off the floor, or you can mop it with soap and water to give it a cleaner finish. Coatings also do not create dust like traditional concrete, which makes your floors cleaner from the start. 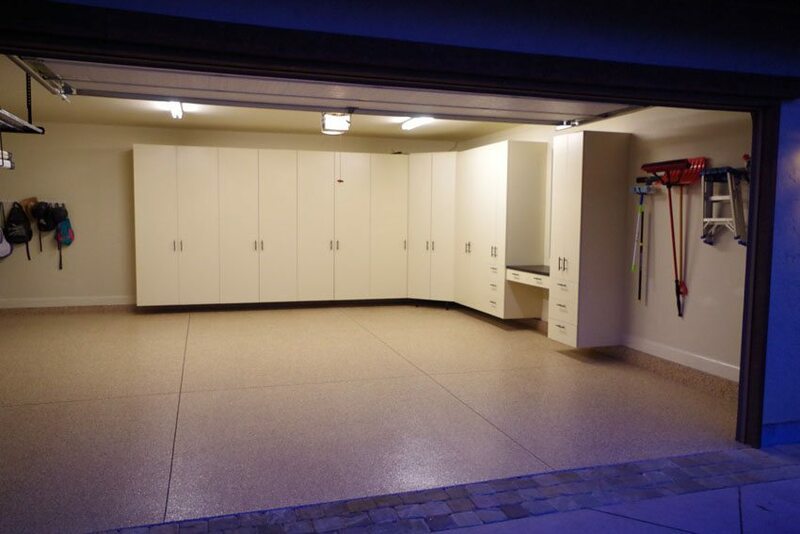 Garage floor coating are a great way to get a new look and keep your floor protected. There are a variety of products offered on the market you can choose from to do the job, but picking the right product is essential to a coatings longevity and durability. need. Contact The Total Garage us today to learn more.